If you just bought a house, painting it is no doubt high on your to-do list. Painting before you move in is the easiest way to get the job done because you won’t have furniture and decorative items in the way. However, some people prefer to live in a new home first to see how natural light affects the space. Regardless of when you decide to paint, there are lots of things to consider before, during and after you put brush or roller to wall. If you can visit the house before the deal closes, take measurements (so you can figure out how much paint to buy) and lots of photos to help you come up with a colour scheme. Some paint companies offer apps so you can add different colours to your photographs. They also offer calculators so you can figure out how much paint to buy. Colour can be used to solve problems, with lighter colours making rooms look larger and darker ones doing the opposite. “If you have a long and narrow room, you can consider painting the end walls a darker shade than the long, narrow walls. The darker colours will recede and create an illusion of width in this instance,” say experts at Sherwin-Williams on the company website. Another Home Hardware trick is to paint the ceiling colour down the wall by one foot from the top and finish it will a narrow moulding to make the ceilings seem higher. 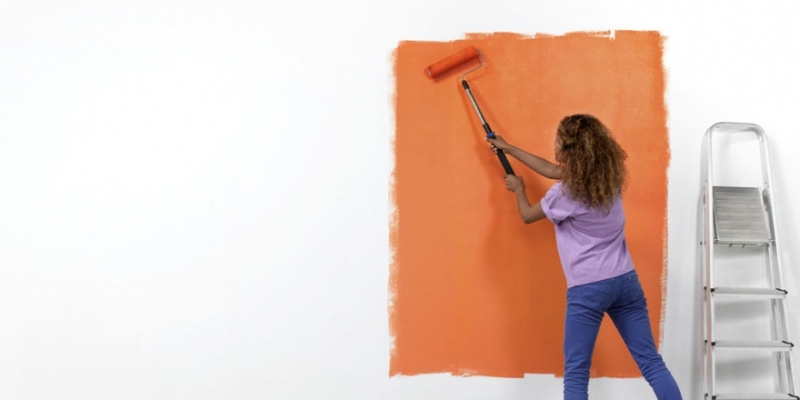 Rather than go with a small paint chip, paint a larger test swatch on the wall to be sure you’re happy with the colour. Some paint companies, such as Benjamin Moore, offer pint-sized samples. “Your colour will look more intense on the wall than on a paint chip. If you are feeling unsure, simply go one shade lighter,” Home Hardware suggests. If you see a colour you love, Benjamin Moore has a Colour Capture app that “lets you capture inspiration colour with your phone’s camera and instantly find its match from Benjamin Moore’s 3,500 plus paint colours,” the company says. Another consideration is the level of gloss, such as high gloss, semi-gloss, flat and eggshell. Glossy paints will show more imperfections than flat paints but stand up better in high traffic areas. You may also want to choose a low VOC (volatile organic compounds) product to keep your space healthier. Some paints also contain anti-microbial ingredients to fight mould and mildew growth. Do you need to prime? Some primers are useful in covering dark colours or blocking stains. For example, Kilz2 latex sealer/stain blocker has a mild odour, is mildew resistant, hides colour, blocks stains and promotes adhesion. It also seals porous surfaces, the company says. Paint companies have their own primers. Check for the features you want. Brushes are available with synthetic and natural bristles, with synthetics lasting up to five times as long as natural bristle brushes, says Dulux. Synthetics are suited to water-based paints. “As a rule of thumb, the larger the area you are painting, the larger the brush you should use,” Dulux says. For example, two or three inches is suggested for cutting in, while a one- or two-inch brush will give more flexibility when painting things such as doors and baseboards, the company says. There are a lot of things to consider before you run out and buy gallons of paint and invite your friends to help out. Plan ahead. If it’s all too much, you can always hire a professional painter.